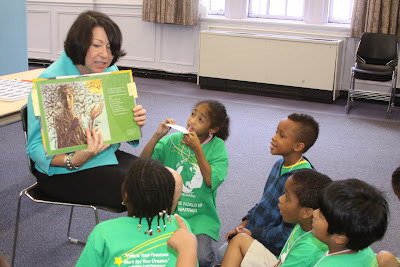 Supreme Court Justice Sonia Sotomayor reads to kids at Lehman College on Saturday. Supreme Court Justice and native Bronxite was the guest of honor Saturday afternoon during a celebration at Lehman College that marked the culmination of the Bronx Children's Museum's "Dream Big" initiative. If you've never heard of the Bronx Children's Museum, it's because it only exists as an organization, which was founded in 2005 by then-borough president Adolfo Carrion. It was incorporated in 2008 and is slated to move into a building on Mill Pond Road near Yankee Stadium and the Gateway Mall in 2013. Current Borough President Ruben Diaz, Jr. has pledged $3 million for the project. In the meantime, as part of its mission, the Children's Museum is organizing various literacy and arts-based efforts. This summer, it collaborated with BronxWorks and The Point to work with youth to produce an art exhibit, which included everything from photography to puppetry, for Saturday's event at Lehman College. The exhibit opening was highlighted by music from the Afro Latin Jazz Orchestra, which was accompanied by musicians from the Celia Cruz Bronx High School of Music. “Today, we also celebrate the achievements of Justice Sonia Sotomayor, a daughter of the Bronx who also dreamed big and whose success is a great example for the children of the Bronx and New York City,” Bloomberg said. Congressman Jose E. Serrano said, "She is perhaps the best example of where hard work and determination can get you. When she was a kid, she looked out those same project windows as I did and kids today do, and through her incredible tenacity and perseverance, she now looks out the window of her Supreme Court office." Sesame Street's Sonia "Maria" Monzan emceed the event. Labels: bronx children's museum, Judge Sonia Sotomayor, Lehman College, ruben diaz jr.
Just FYI, Maria real name is Sonia Manzano, and I highly recommend her kids' book, "No Dogs Allowed". Thanks Greg, for the correction and the tip.